Mr. and Mrs. Otter Vale were out and about in the Otter Valley earlier today, and very pretty it was too in the sunshine, even though the Otter was actually “pretty” brown! Mind you, that wasn’t a great surprise, given the recent rainfall. It’s been one of those weeks where the weather has been all over the place, with gales and floods. That got Mr. Otter Vale to thinking about casseroles, stews and other hearty meals; whereas Mrs Otter Vale’s mind has been elsewhere – namely warming winter puddings. Fortunately, we have another magnificent recipe to share from the human dynamo that is Sue Stoneman. As well as having a day job at Big Fire, at The Shops @ Dartington, Sue is the South West’s queen of cooking and baking on al fresco, and was South West Chef of the Year‘s winner of the Home Cook in 2016 and 2017. To keep her out of trouble (well, we think that’s possibly the plan) she is also a food writer and blogger, notably as part of the Dining Devon team. Sue has impeccable pedigree for desserts, having been both West Country Baking Champion and Sticky Toffee Pudding Champion. 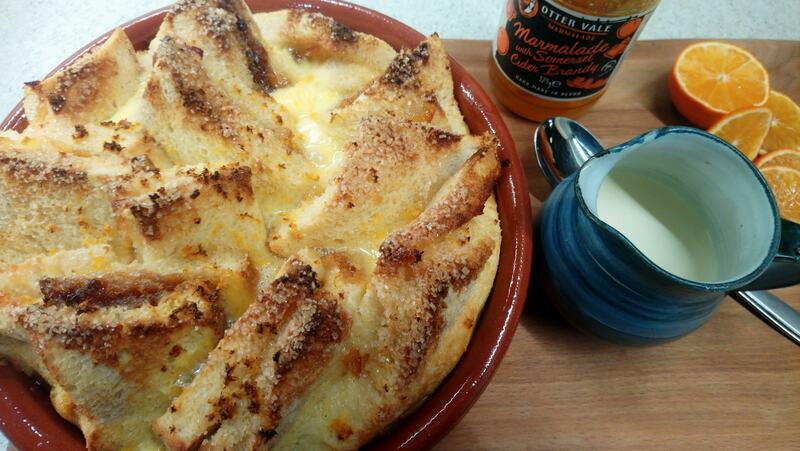 So when she used our Otter Vale Marmalade with Somerset Cider Brandy in one of her recipes, we were delighted. The not-so-secret ingredient is from the The Somerset Cider Brandy Company, of Kingsbury Episcopi. Set in a farm where cider has been pressed for over 200 years, the Temperley family and their team make award-winning cider and have been distilling it into their Somerset Cider Brandy under licence for almost 30 years. Two bits of trivia here, theirs was the first full cider-distilling licence ever to be granted in the UK. And their ten year old Somerset Cider Brandy was the only spirit on the menu at the recent wedding of Prince Harry and Meghan Markle! They also make their own award-winning ciders and liqueurs – which we can assure you, quite simply taste great. 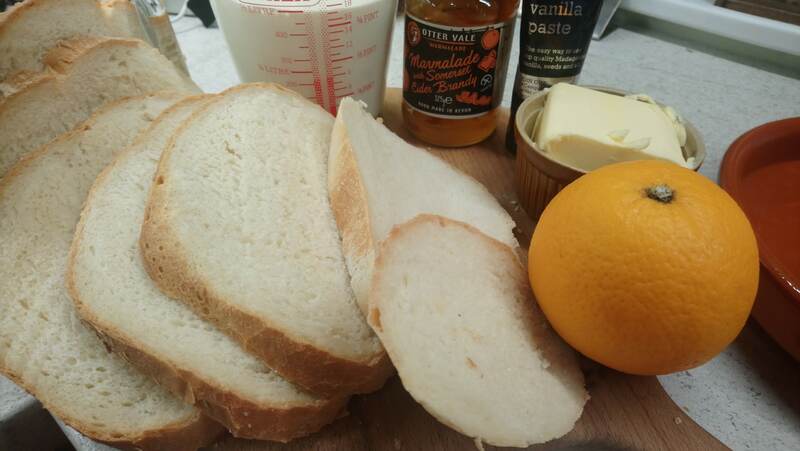 Now you know what makes our marmalade so special! Those of you who also know Mrs. Otter Vale know that her culinary skills are fairly limited to tea, coffee and toast. 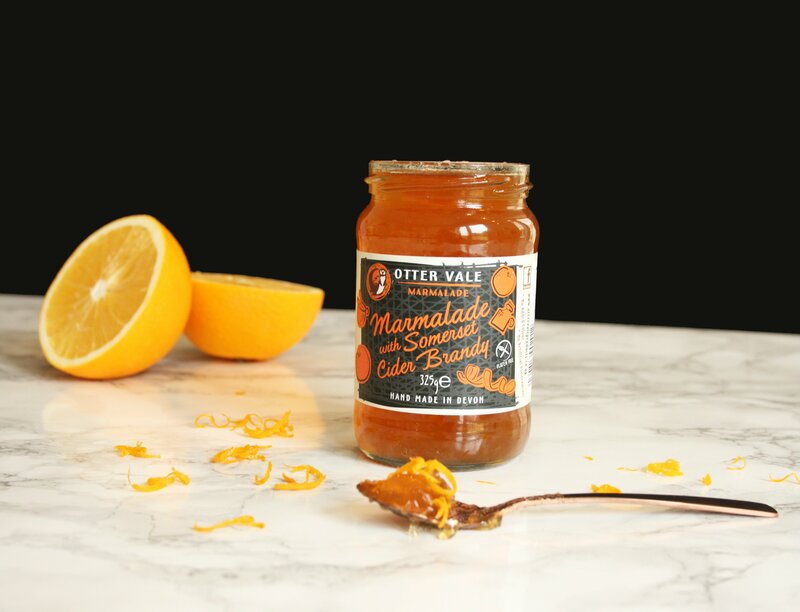 No wonder marmalade is one of her favourite Otter vale products. She’d say she likes to keep it simple, Mr. Otter Vale simply snorts. But then, he does do 99% of the cooking at home. That said, due to her cold hands, she used to be quite useful at baking, and Sue assures us that this recipe is really quite simple. So we’ll show you how Sue makes it first and then maybe one day, we’ll see what Mrs. Otter Vale can come up with! Here’s the recipe in Sue’s own words below. 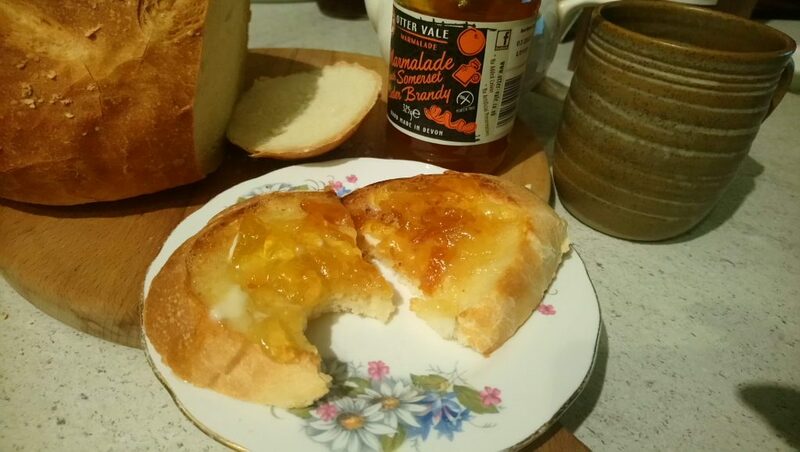 I’m starting to get into a little spirit for the festive season having spied Otter Vale’s tangy slightly boozy (with Somerset Cider Brandy) marmalade on my visit recently. 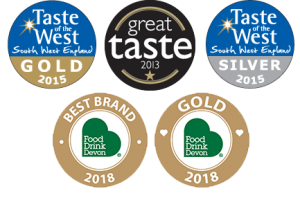 Now I have a few of my favourite jars in the cupboard, five at the last count and that’s not including two nearly empty ones in my fridge, but I didn’t know Marmalade was amongst one of the many jars that is produced here in Devon. 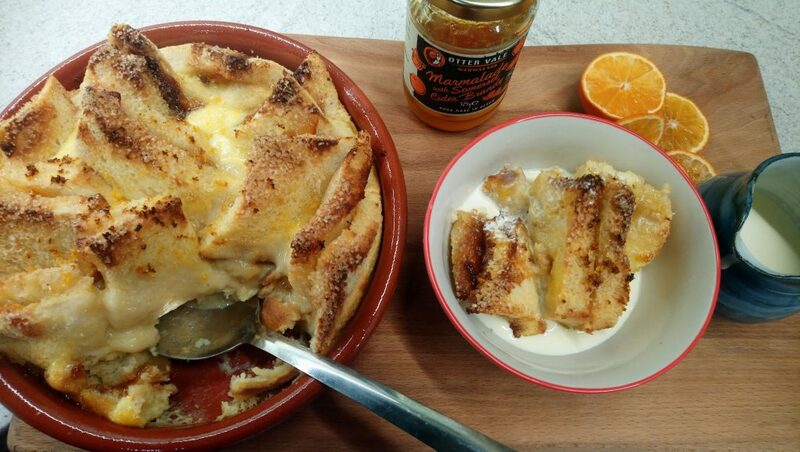 As soon as I saw it, I knew I wanted to make one of my family’s favourite comfort puds, a Marmalade Bread and Butter Pudding. Served warm from the oven it’s ideal for the chilly winter days and great served with cream or custard, or both as I like, although Mr S will always have ice-cream with his. Even crème fraiche goes well with it if you are keeping an eye on the calories although this is not a dish to eat if you are! I did of course have to make a loaf of bread first but you could also make it with any leftover rolls or stale bread and is also great made with brioche and croissants. I thought I had better try the marmalade out on a piece of toast and it was delicious. Yes, I had another piece it was that good. Here’s the recipe. It’s very easy, just make up some marmalade sandwiches, an egg custard and Bob is your Uncle! Use some of the butter to grease your dish. 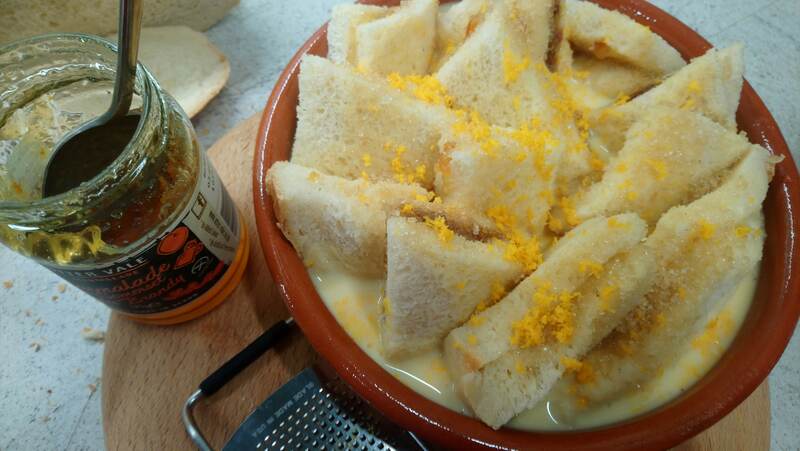 Butter the slices of bread and spread on the marmalade. Make them into sandwiches and cut each into four shapes. Arrange the pieces roughly and up ended in your dish. The pointy bits get all crisped up and chewy when it bakes and are my favourite bits. Next make the egg custard. Into a bowl pour the milk, cream and break in the eggs. You could add a splash of brandy in with the milk for some added warmth. I did! Tip in the caster sugar, squeeze of vanilla paste and whisk until it’s all mixed together. Pour this over all the sandwiches. Sprinkle the top with the demerara sugar and the orange zest. Now, it’s best if you can leave it in the fridge for an hour or so if you’ve time as it then allows the custard to soak up into the bread. When you are ready to bake it, put it in the oven 170C for about 30-35 minutes until the custard is just set and the top is golden and crispy. Serve warm with cream, ice cream or custard. You could add in chunks of dark chocolate before baking for extra indulgence. Curl up in front of the fire, with a fork or spoon, and enjoy!